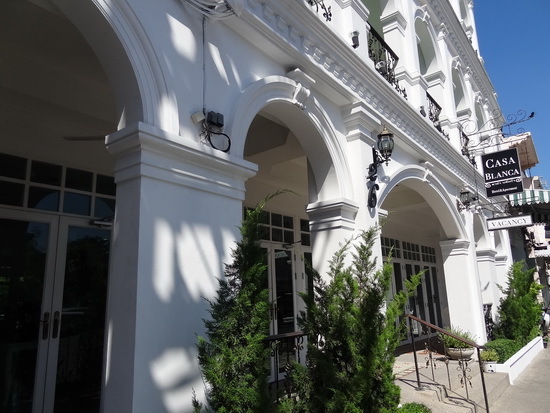 Found on Phuket Road near the Old Town streets of Phuket Town, Casa Blanca Boutique Hotel offers a good base for exploring the area’s restored Sino-Portuguese buildings and sampling some of Phuket’s tastiest and best-value local food. Casa Blanca’s entrance: styled after the Old Town’s Sino-Portuguese buildings. Its rather grand lobby with a chandelier is a cool and tranquil retreat from the motorbike-clogged street out front. A cafe is tucked away behind the lobby in a room with an indoor garden and fountain under a vaulted-ceiling skylight, and a swimming pool is upstairs. Casa Blanca’s guest rooms are all air-con with private hot-water showers, LCD TVs, mini-fridges and safes. Each of the hotel’s 17 rooms are bright with colourful works of art and pillows adding cheerful touches. There are three room types: the 25 square-metre superior room with a king-sized bed, a 35-square-metre deluxe room with king-sized or twin beds and a 50-square-metre family room with two king-sized beds in a master suite and a double bed in the junior suite. The family room has a separate living area and pantry with a microwave. Deluxe room with twin beds and a street-view balcony. Views are not much to speak of, either a street view or overlooking the hotel’s garden or pool. Opened in 2011, Casa Blanca has since added double doors along its front to keep the traffic noise out, but ask for a room at the back if you’re sensitive to noise. For high season (November-April) we were quoted 2,300 baht for the superior room, 2,800 for the deluxe room (with an option to add an extra single bed for a 500-baht charge), and 5,500 baht for the family room for a one-night booking. Discounts are available for longer stays and during the low season, and we were able to find prices as low as 1,500 baht on an internet search. There’s also a special package available that combines a stay with a Thai cookery course. Tiny pool but a great way to cool down after walking the Old Town streets. With no breakfast included, the rates are a bit high for a Phuket hotel nowhere near the beach, but it can be good value for a family or small group looking for a place with added style and service. It’s also convenient as an overnight stop for those catching the ferry to Phi Phi or other Andaman-coast islands. Travellers on a budget can easily find cheaper options nearby around Phuket Town, the island’s best-value area for hostels, guesthouses and backpacker-oriented lodgings. 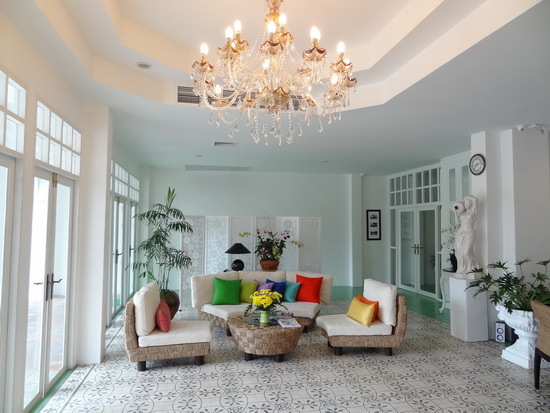 Other Phuket Town choices in Casa Blanca’s price range, such as the Phuket Merlin Hotel or Royal Phuket City Hotel, have more facilities but are not as centrally located and tend to be on the bland side. Tours and transport may be arranged with the 24-hour reception service, though better deals might be found at travel agencies nearby. There are free internet stations near the reception desk and WiFi is available throughout the hotel. Those hiring a car or motorbike may park for free along the street, but it can be difficult to find a spot during the day. The lobby: inviting and cool. Some of Phuket’s tastiest restaurants and local food shops are within walking distance. Within just a few minutes’ walk are cheap and delicious roti, kanom jin and dim sum shops, plus bakeries. For a more dressed-up night out, there’s The Brasserie for imported oysters and Belgian beer, Siam Indigo for modern Thai cuisine and cocktails, Raya Thai for Thai food in a retro Sino-Thai house, and Ka Jok See nearby. 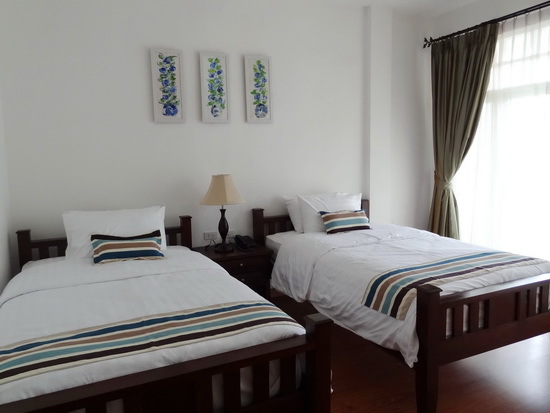 Being a fair distance from any beach, Casa Blanca is not a place for sun-seekers, but overall it’s cheerful and well designed for those wanting some added comforts, and ideally located for exploring Phuket’s cultural sights. Check rates at Casa Blanca Boutique Hotel on Booking.com.